Depending on what type of air conditioning unit you have, part or all of your unit may be located outdoors. Over time, the outdoor components can work up a good layer of dirt, dust, and debris. Similarly, as some of that debris gets sucked inside along with fresh air, the indoor components of your air conditioner can be adversely affected as well. Some of this debris will naturally get stuck inside your indoor air duct system as well as in your air filter and interior components. Over time, this can lead to inferior unit performance, increased energy bills and noticeable health issues for you and your family. In this post, learn about the different components of the average air conditioning unit, how they can be affected by dirt and debris, and what type of cleaning and maintenance can help keep efficiency high, costs low, and you and your family healthy and cool. Depending on the make and model of your A/C unit, you may have the kind of air filter that can be washed and re-used or the kind that needs to be replaced regularly. In either case, it is generally recommended that you clean or replace your air filter monthly during the warm season. When you don’t, you run the risk of decreased operational efficiency along with increased energy costs. As well, any dirt or debris that gets caught in your air filter can get pushed back out into your home, creating contaminated air. But worst and scariest of all, Canadian Firefighter reports that when your air filter gets really clogged, this can cause a home fire. The air ducts are the unseen components tasked with transporting temperature-controlled cool air to every room in your home. Of course, you will have air ducts only if you have a ducted air conditioning unit (the new ductless air conditioners use a zone system instead of ducts to achieve the same effect). When your air ducts begin to accumulate dust and debris, not to mention uninvited guests like bugs and rodents, their job transporting air begins to get harder. The air conditioning unit has to push harder to propel the air through the ducts, which means it draws more energy. Even worse, a small portion of the built-up, trapped debris inside the ducts will get pushed out of the air registers into your home, where you will then breathe it in. Health symptoms can include itchy, watery eyes, runny nose, sore throat, congestion, asthma attacks, and worse. The condenser is the largest and most important component in an air conditioner. The condenser is constantly working to repel incoming heat, create vapour, and then condense that vapour into liquid. This is a major process to ensure temperature controlled air output. When the condenser housing or exterior coils begin to get dirty, a number of issues may arise. First, the moisture level may rise, attracting colonies of bacteria and fungi. As these colonies thrive in high-humidity conditions, they send out spores that enter your indoor air supply, causing a wide range of respiratory and health issues. The condenser itself will also begin to function less efficiently, drawing more energy to do the same job and hiking up your cooling bills while providing less cool for the money. Your A/C unit has two sets of coils: the condenser coils and the evaporator coils. Where the condenser coils are responsible for releasing extra heat back to the outside, the evaporator coils are responsible for delivering the heat to the condenser coils. As such, both sets of coils are equally at risk of becoming dirty and clogged with dust, debris, pollen, and other detritus. They are also both at risk of becoming too moist, and can begin to host colonies of bacteria, fungi, and mould that affect your family’s health. But most importantly, every component in your air conditioner has an impact on all of the other components as well. For example, a dirty evaporator can impact how well the fan motor and the compressor can function. When these components overheat or break down, the opportunity for cleaning and repair has passed and you are now talking about an expensive replacement. 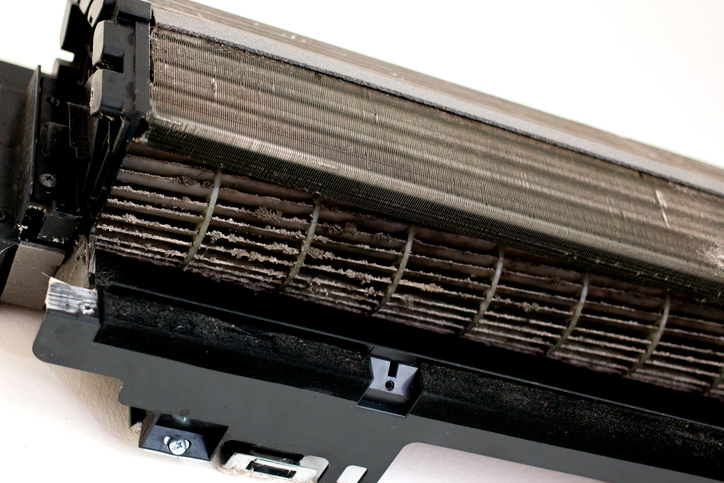 It can be a real challenge to remember to clean your HVAC unit regularly. That is why Shipton’s has developed a series of protection plans to help you with this necessary chore. When you sign up for one of these plans, you transfer to us the responsibility of remembering to perform routine HVAC cleaning and maintenance. You also reap plenty of valuable savings. We will even call you when it is time for your maintenance checkup! Join Us for an Archeological Adventure! Here at Shipton’s, we love to learn about history. For instance, let’s say we find an antique working air conditioning unit. We get very excited about this kind of discovery! Sometimes the unit is so old and we get so excited we give the unit’s owner a FREE new air conditioner just so we can have the old one! Starting this month, we are running a contest to find the oldest still-working A/C unit in our greater service area. To accomplish this, we will be recording the age of each unit we replace during July and August. When we find and replace the oldest unit of all, we will refund the owner the cost of their new A/C! Who knows—if you choose to replace your air conditioner this month, the winner could be YOU! Click here to learn more about the contest and participate! Or give us a call at 905-549-4616.